How do I view Images, Video, & Additional Information? After a part or vehicle search, simply click on the stock number to open the vehicle details page. On this page you may view the VIN, color codes, image gallery, and a video if available. Full Size: Left click on a thumbnail to view full size image. Zoom: Move pointer over area of interest, left click to zoom, & left click again to return. From the Vehicle Details page, click on the YouTube Video Link on the lower left. No video currently exists if the YouTube logo does not appear. Click on Google Maps link above for directions. You may also call 717.867.2151 and press the appropriate number to access directions. We are open Monday thru Friday, from 8:00 AM to 5:00 PM. Click here to decode VIN and obtain information about your vehicle. What is a VIN ? The VIN (Vehicle Identification Number) is an alphanumeric series which uniquely identifies a vehicle. The VIN is 17 digits on all vehicles produced from 1981 to current and does not contain the letters I, O, or Q. Vehicles produced prior to 1981 may have a shorter VIN. Decoding a VIN may offer information such as country of origin, manufacturer, make, model, safety restraint system, engine type, transmission type, year, and additional options. All website orders require the VIN of the vehicle getting repaired or improved in order to help us deliver the right part the first time. How do I Track a Phone Order? Go to the home page by clicking home or the logo at the upper left corner. For SMALL packages, enter your order number in the box below Track your order. For UPS Freight, enter the UPS Bill of Lading number in the box below Track your order. Submission numbers do not work. What actual Year is my vehicle ? The year is not based on the production date but is determined by the 10th digit of the Vehicle Identification Number (VIN). Pleaes use VIN decoder or refer to the table below to calculate the year of your vehicle. Where is my Production Date? The production date is the time the vehicle was manufactured. This is not to be confused with the year of the vehicle. The year of the vehicle is determined by the 10th digit of the VIN for vehicles made on or after 1981. The production date is commonly printed on the information sticker located on the driver’s door or door jam. Where do I find my Vehicle's Interior & Exterior codes ? The exterior & interior codes are sometimes printed on the information sticker located on the driver’s door or door jam. Using the VIN, your local dealer can determine the vehicle’s interior & exterior color codes & names. Do I have a Forklift or Shipping Dock ? When creating a new account, you will come across this question so we know if you are capable of handling large freight shipments. NO: If you do not meet the requirements. No big deal, just click no and continue. How do I set up my account for Tax Exemption ? 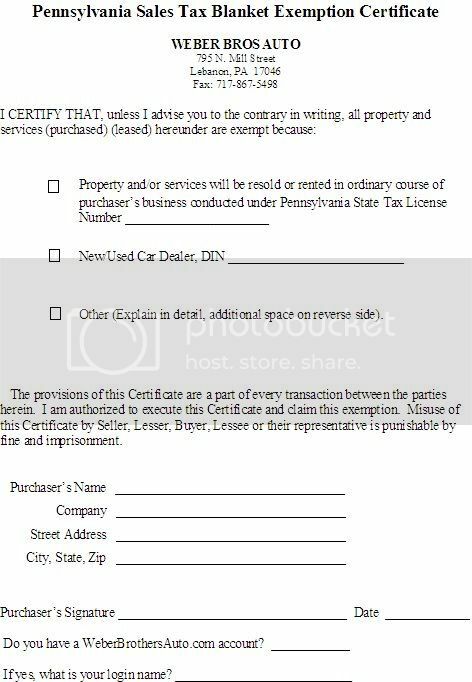 Please click here to print the Pennsylvania Sales Tax Blanket Exemption Form. After filling out the form, you may fax or mail it to Weber Brothers Auto. If you feel that we already have your tax information on file please email us at info@weberbrothersauto.com and request a tax exemption on your website account. Please include your name, company name, login name, and a phone number that we can reach you. What is the difference between a Submission and an Order Number ? The Submission Number references a customer's intent to make a purchase. After a sales representative reviews the submission and feels confident that the part ordered will fit the vehicle being repaired, an Order Number will be generated. You will then be notified of the Order Number and expected time of arrival. When contacting a representative please have this Order Number on hand in order for us to better serve you. How do I make a Bank Wire Transfer ? Please contact us for instructions on how to make a Bank Wire Transfer. Contact us with your order number and obtain a return authorization number.